Rising Sun is a spiritual successor in the same mythic big box series as Blood Rage: same designer, same artist, same studio and same sculptors. 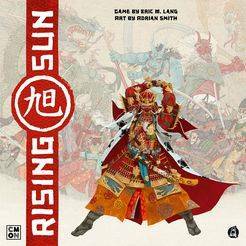 Rising Sun is a game about honor, negotiation, and warfare in a feudal Japan where the ancient gods (kami) have returned to rebuild the empire. Whereas the distant ancestor of Blood Rage was Risk, Rising Sun claims Diplomacy as its distant ancestor. Tackle negotiations, alliances, and war. Capture hostages and commit seppuku. The game features an honor track, which rises and falls based on your actions.